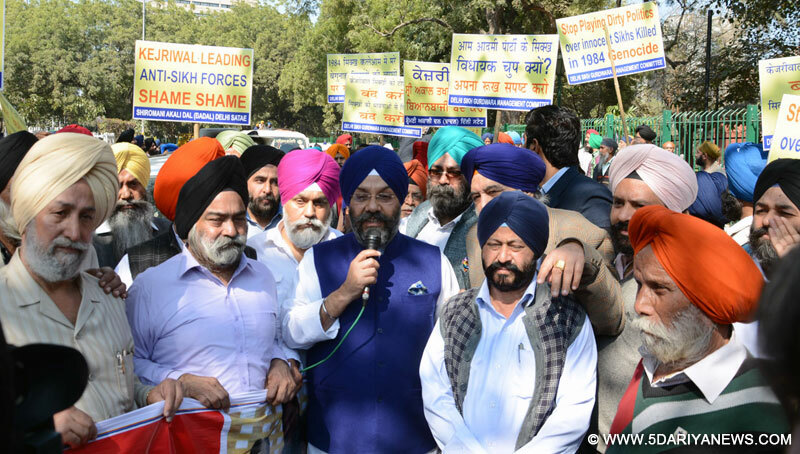 Delhi Sikh Gurdwara Mangement Committee (DSGMC) today staged two protest one at jantar- mantar and second at karkardooma court against congress leader Jagdish Tytler accused of perpetrating Sikh genocide of 1984 & Delhi chief minister Arvind Kejriwal. Sikh protestors led by the president of Delhi Sikh Gurdwara Management Committee - DSGMC Manjit Singh G.K. demanded C.B.I. probe against kejriwal & Tytler meeting. Another protest by Akali dal is staged outside Karkardooma Court against Delay of Justice led by Ex Mla Jatinder Singh Shunty. Hundreds of protestors which also included a large number of ladies protestors raised slogans against the Kejriwal & Congress party. G.K. have questioned the Chief Minister of Delhi and Aam Aadmi Convener Arvind Kejriwal for maintaining silence on his meeting with the perpetrator of 1984 Sikh genocide on 25 December 2015.The People particularly Sikhs want him to reply as to what was the compulsion to meet Tytler especially when Kejriwal is trying to project himself as protector of rights of the Sikhs and giving promises to the Sikhs to get them justice for their sufferings in 1984 genocide. Speaking on the letter written by Kejriwal to Prime Minister Narendra Modi asking him to arrest Jagdish Tytler, Manjit Singh G.K. said that by writing such letters Kejriwal can not justify his meeting with Jagdish Tytler and he had to explain to the Sikhs who are waiting for his reply.The letter written to the Prime Minister is the attempt to take refuge behind the Prime Minister to divert attention from his meeting with Tytler and Sikhs understand that, G.K. said. He also said that Kejriwal is doping politics on the sufferings Sikhs families who suffered tremendous losses in genocide. Same Kejriwal declared in Maghi rally in Shri Mukatsar Sahib - Punjab on 14 January that he is not afraid of Badals or their tau – uncle, Narendra Modi, now why had he approached the same person to put curtain on his fallacy says Manjit Singh G.K.DSGMC vice president Satpal singh,joint secretary Amarjeet Singh Pappu, members Kulmohan Singh,Tanwant Singh, Gurvinder pal singh,Hardev Singh Dhanoa,Darshan Singh,Captain Inderpreet Singh,Chaman Singh,Gurbachan Singh Cheema,Harvinder Singh K.P.,Manmohan Singh,Gurbaksh Singh Montushah and Akali leaders vikram Singh, Raja Singh Chawla, and Amarjeet Kaur Pinky also take part in the protest.